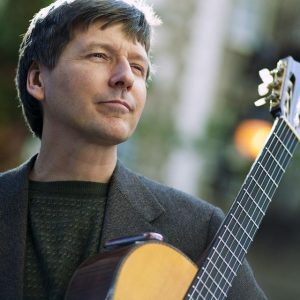 Guitarist Paul Meyers has performed and/or recorded with an ever-growing list of jazz greats such as Geri Allen, Harry Allen, Kenny Barron, Ron Carter, Ray Drummond, Clare Fischer, Sonny Fortune, Eddie Gomez, Annie Ross, Wynton Marsalis, Bill Mays, Rufus Reid and Steve Wilson. He has released numerous CDs of his own, including four solo guitar CDs. A very active player in New York’s vibrant Brazilian jazz scene, Paul was a member of the Terra Brasil. He later co-led Brasil & Company with Vera Mara, and they released a highly regarded CD as well. He has performed in New York and Tokyo with the great Tango-jazz pianist and composer Pablo Zeigler and is featured along with Stephon Harris on the live CD Tango meets Jazz. Paul has also performed in great Brazilian ensembles with Paul Winter at his Winter Solstice concerts and in small groups. Paul continues to perform regularly in and around the NYC area with his own groups and as a sideman with many others.